Orléans is a new game from dlp games who released the highly-entertaining game Citrus last year. 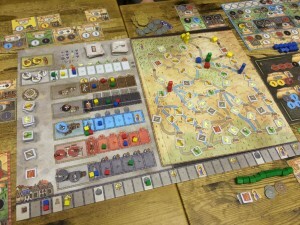 Orléans combines multiple game mechanics such as bag-building, meeple movement, and worker placement. Each player has a bag of character tokens (farmers, knights, craftsmen, etc.) and players can add more tokens to their bag during the game. At the start of each round, players draw some characters from their bag, and each player places them on their player boards in specific combinations to activate actions. Most actions require 2 or 3 characters, so I can see there will be some tricky choices deciding in which combinations to allocate the drawn characters each turn. Players can part-fill actions and complete them on a later turn too.